Students will be able to use adverbs in sentences. Have students take out their whiteboards. Tell students that you will act out a sentence, and students will think of one word to describe the action that is being performed. Allow students time to write down one word to describe the talking. Collect student answers by writing them on the board. Circle the words that are adverbs. Explain to students that we can use adverbs to describe actions. Today’s lesson will be about how to use adverbs in sentences. Introduce the adverb game to students. Pick an index card with an adverb on it (e.g. slowly), and do not show it to the students or tell them the adverb. Explain to students that your job would be to complete all of these tasks based on the adverb on your index card. Practice the game with the students by acting out the sentences slowly. Allow students to guess the adverb that was written on the card. Model how to turn the activity into a sentence by writing on the board: She slowly sat down at the desk. Circle the adverb, and draw a line to the verb that it modifies. Divide the class into small groups of 3–4 students. Number the students in the group to determine the order in which they will be the leader. The leader will be the person who does the acting. Show each leader an index card with an adverb. Remind students about how to play the adverb game. 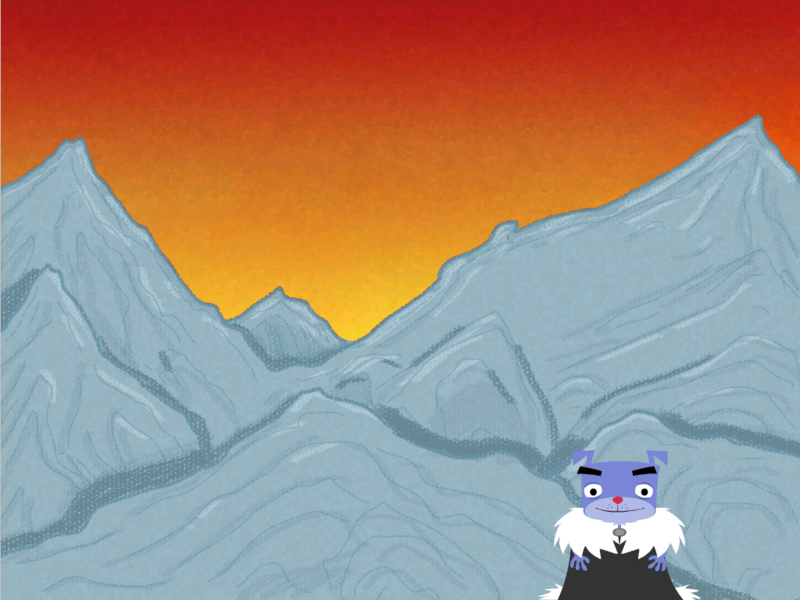 Circulate and monitor while small groups play the game. Give enough time for the game so that all students have completed their role as the leader for their group. Have students use their whiteboards to write a sentence with the adverb they acted out during the game. Gather students back together to discuss their experience with the adverb game and to share the sentences they wrote with adverbs. 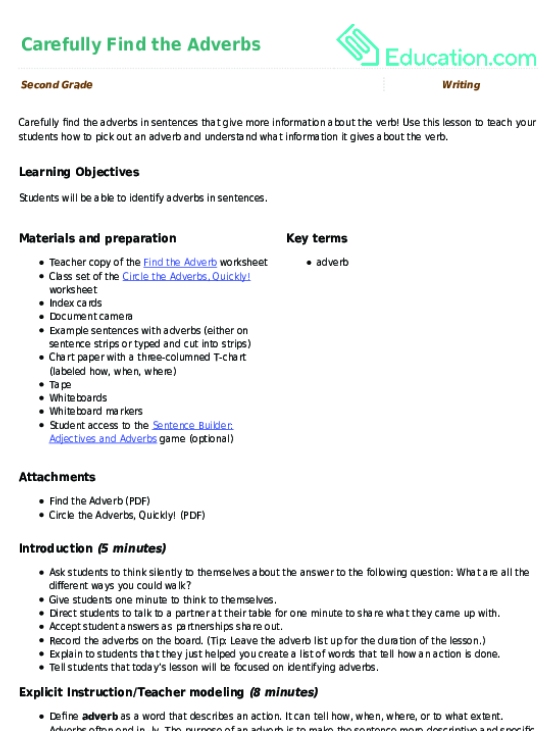 Distribute a copy of the All About Adverbs: Writing Sentences #1 worksheet to each student. Remind students that adverbs describe an action. Instruct them to circle the adverb in the sentence and draw a line to the verb that it describes. 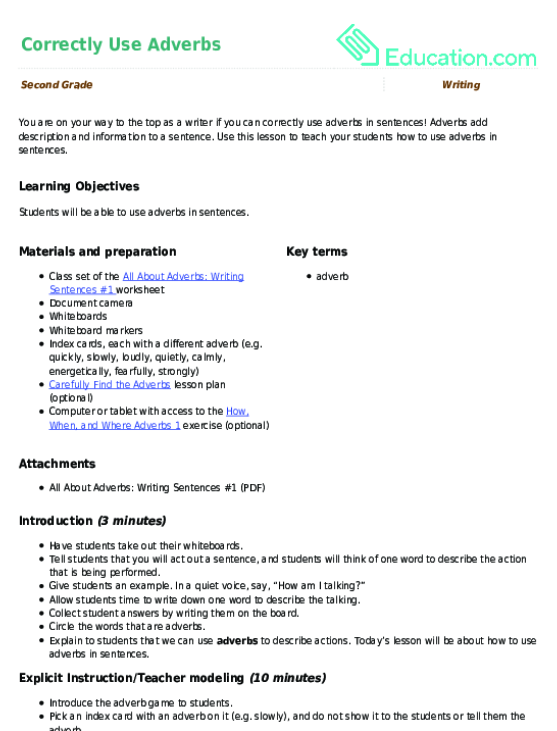 To go back to the basics, use the Carefully Find the Adverbs lesson plan. Intentionally group students together in a way that allows a stronger student to support a struggling student. Offer language learners visuals of the adverbs and verbs used in sentences. Reduce the number of sentences students need to produce on the independent practice worksheet. Give students a word bank of adverbs to choose from during the adverb game. Challenge advanced students to write a story and use an adverb in each sentence. Offer further practice with adverbs by having students complete the How, When, and Where Adverbs 1 exercise. Collect the All About Adverbs: Writing Sentences #1 worksheet from students to serve as a check for understanding. Display a cloze passage on the document camera or on the board. Call on non-volunteers to fill in the blanks with adverbs. You are on your way to the top as a writer if you can correctly use adverbs in sentences! Adverbs add description and information to a sentence.